Heart - ARDUINO NANO V3.0, buttons, encoder and software. Sketch wrote to order a professional programmer. It appears that Maxim doesn't have a full store, but rather sells the devices on VK Markets, which is a Russian clone of Facebook. 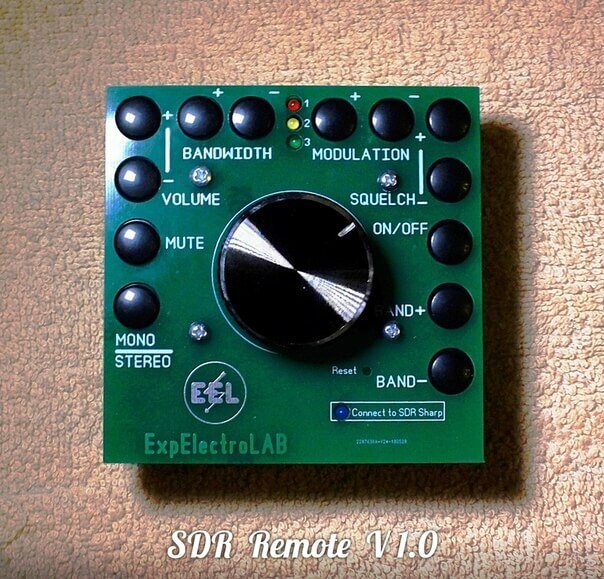 Also at the moment only SDR-Remote V1.0 is available for sale, but V2.0 seems to be due to go on sale soon. Version 1.0 sells for 2,650 Rub, which is equivalent to around US$42. His store also contains various other home brew SDR related products such as upconverters, LNA's, filters and a fractal antenna. The video below in in Russian, but shows V2.0 being unboxed and demonstrates it working with SDR#. Maxim has noted that you can contact him at [email protected] if you are non Russian and are interested in his products. Will this work with SDR-Console and OpenHPSDR? If so, how do you purchase one and whats the cost in USD? The device arrives with the tune knob removed and so far nothing strange … pity that the hole is 5 mm. while the encoder pin is 6 mm. Remedied with a drill bit enlarging the hole plan. And then it’s a knob that’s too light. After a few days I replaced it with a heavier metal knob and the use has improved. Band change is limited and ranges from 160 m. at 70 cm. It is necessary to get used to the tuning step because the leds indicates 1 2 3 and not the selected step. Every time you start SDRSharp the parameters are not synchronized. After the first use of the keys, the software synchronizes. Am I satisfied with the purchase? Yes a lot. No indent for index finger, wow. Budget version. Rotary knob with a place for the index finger + $ 20. I stopped using Griffin because it had a smooth knob, so pretty useless for band scanning. We offer a budget version.